Jane Wicker and Charlie Schwenker were killed Saturday in a fiery plane crash in Dayton, Ohio. Investigators said Sunday that it was too early to rule anything out as the cause. CINCINNATI — Risking death every time they go to work, wing walkers need courage, poise, a healthy craving for adrenaline, and, most importantly, they need to be meticulously exacting with every step they take on the small planes that carry them past dazzled crowds at speeds up to 130 miles per hour. Jane Wicker fit that bill, her friends and colleagues in the air show industry said Sunday. Wicker, 44, and pilot Charlie Schwenker, 64, were killed Saturday in a fiery plane crash captured on video at a southwestern Ohio air show and witnessed by thousands. The cause of the crash is not yet known. Jason Aguilera, the National Transportation Safety Board investigator leading the crash inquiry, said Sunday that it was too early to rule anything out and that the agency would issue its findings in six months to a year. Wicker, a mother of two teenage boys and recently engaged, sat helplessly on the plane’s wing as the aircraft suddenly turned and slammed into the ground, exploding on impact and stunning the crowd at the Vectren Air Show near Dayton. The show closed shortly afterward but reopened Sunday, with a moment of silence for the victims. The crash drew attention to the rarefied profession of wing walking, which began in the 1920s in the barnstorming era of air shows after World War I. The practice fell off the middle of the 20th century but picked back up again in the 1970s. Still, there are only about a dozen wing walkers in the United States, said John Cudahy, president of the Leesburg, Va.-based International Council of Air Shows. Teresa Stokes of Houston said she has been wing walking for the past 25 years and does a couple dozen shows every year. The job mostly requires being in shape to climb around the plane while battling winds, she said. Stokes, an aerobatic pilot before becoming a wing walker, said she was attracted to performing stunts because of the thrill. He said they tell people who are interested that it would take a year of training before they’ll be allowed to walk on the wing of an airplane in flight. ‘‘I don’t know of anyone who could have done any better than what they were doing,’’ he said. In one post on Wicker’s website, the stuntwoman what she loved most about her job. 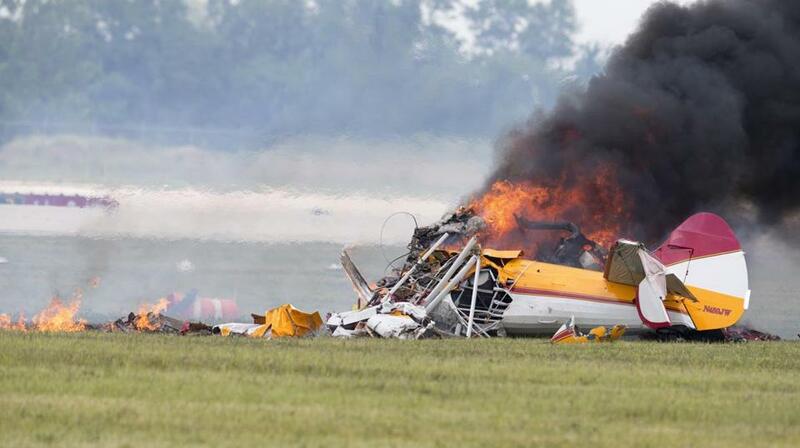 From 1975 to 2010, two wing walkers were killed, one in 1975 and another in 1993, Cudahy said. But since 2011, three wing walkers have died, including Wicker.